SUMMERTIME! And the livin’ is easy! And so is the grillin’ of a home-made Pizza Margherita with all of those ripe tomatoes from the garden. Pizza Margherita originated in Naples somewhere around 1899. A guy named Raffaelle Esposito created it for Queen Margherita when she was in the area to escape a cholera epidemic that was taking place in Northern Italy. The chef named the pizza after the queen when he received a letter from her stating how much she enjoyed the pizza. Besides the infamous thin crust, the ingredients that distinguish this unique pizza include fresh tomatoes, fresh bufalo mozzarella and fresh basil, each representing the red, white, and green colors of the Italian flag. This traditional Neapolitan pizza’s popularity has been steadily growing in the States. But for years you could only find this hallmark pizza in larger cities such as NYC. One difference that I noticed with the traditional New York pizzas, although they have thin crusts . . . is that they aren’t as ‘firm’ as those prepared in Italy. You know how New Yorker’s are infamous for folding those large slices of pizzas in half. . . the crust is more pliable! To me, the crust is yummy both ways. The good news is that if made correctly, you can enjoy this delicious pizza at home! If you have a pizza stone, that’s great! But if not, use a perforated pizza pan to allow the oven’s heat to come through and cook the bottom of the pizza dough better. Several keys to success for a Margherita Pizza is a super thin crust with minimal toppings . . . actually less is more, so remember not to overload toppings on this pizza. Always use the highest quality ingredients of mozzarella, tomatoes and basil too; this is so important to attain the level of taste and quality that this pizza is known for. This pizza truly rivals any of those offered in New York City and (some pizzas) in Italy! There’s some bad pizza made everywhere, including Italy. I know that sounds sort of sacrilegious, but it’s the truth. Just because you’re eating pizza in Italy, doesn’t mean that it’s always going to be perfect everywhere. authentic Pizza Margherita in Italy! and THIS Pizza Margherita is what we made at home! Insert a pizza stone (if you have one) on the LOWEST rack level in the oven for 1 hour to heat up prior to place a pizza stone on a heated outdoor grill and again, allow the stone to heat up. In a small pan over medium heat, cook the smashed garlic cloves in the olive oil until golden . . . do not burn. Add about 5 basil leaves, torn into small pieces. If using canned San Mareno tomatoes, cook for 20 minutes with the olive oil/garlic/ basil mixture in order to reduce and thicken the tomatoes into a sauce. Do not punch down the risen pizza dough. Lightly dust the dough with flour, dust your hands, and dust the surface that you will use to roll out the dough. If you have a wooden pizza board/paddle, use that as your surface, you can also use a large piece of parchment paper. Gently pat down the dough and then push it out to form a large circular shape (about 16 inches in diameter). Using a wooden rolling pin (dusted with flour), roll out a very thin crust about ? inch thick. Dust the pizza stone with flour or a little bit of finely ground cornmeal. If you rolled out the dough on your counter or cutting board, then slide the pizza dough onto a wooden pizza board (if you have one) or parchment paper at this time. Spread the tomato/garlic/basil sauce all the way around the pizza dough except for about 1 inch from the edges. Layer the mozzarella slices all over the sauce. Layer the dried, sliced tomatoes over the cheese. Layer a little more shredded mozzarella cheese. Sprinkle freshly grated Parmigiano Reggiano cheese on top. Sprinkle with the remaining whole basil leaves and crushed oregano. Season lightly with freshly ground sea salt and black pepper. Bake for 15 – 20 minutes on the lowest rack level in the pre-heated oven. Note: With a paper towel, blot off any excess fluid that may come from the tomatoes; thus the reason why I dry out the tomatoes a little bit before placing them on top of the pizza before baking. Cover edges with aluminum foil and bake for another 10 minutes to prevent the edge of the crust from burning. Broil for 5 minutes if desired (I do this) or until desired level of doneness and golden brown-ness of the cheese is achieved. Layer the sliced fresh buffalo mozzarella, sliced and dried tomatoes and basil on top of sauce and dough. Sprinkle with oregano, sea salt and black pepper. Blend yeast, 1 Tbsp. flour and 1/4 cup warm water in a large bowl. Let stand for about 5 minutes, until the surface looks slightly creamy. Add 1-1/4 cups flour, 1/2 cup warm water, salt and oil. Add in enough more flour (1/4 to 1/2 cup) for dough to start to pull away from the sides of the bowl (it will be somewhat wet). On a floured surface (wooden is best), knead the dough until smooth, soft and elastic for 10 minutes. Add more flour dusting to surface if dough becomes too sticky. Form dough into a ball, put in a dusted bowl, dust the top of the dough with flour and cover with plastic wrap or (non-terry cloth) kitchen towel. Let dough rise in a draft-free, warm room until doubled in size, 1-1/4 hours. Lastly, here is a testimonial post from an outstanding food blogger, Larry, of Big Dude’s Eclectic Ramblings, about his experience with this Pizza Margherita recipe: A Little Time With Roz — Pizza Margherita. Larry “Big Dude’s” results from baking this Pizza Margherita recipe! Before you go, here’s a shot of Mount Vesuvius, the active volcano that sits right next to Naples, Italy. 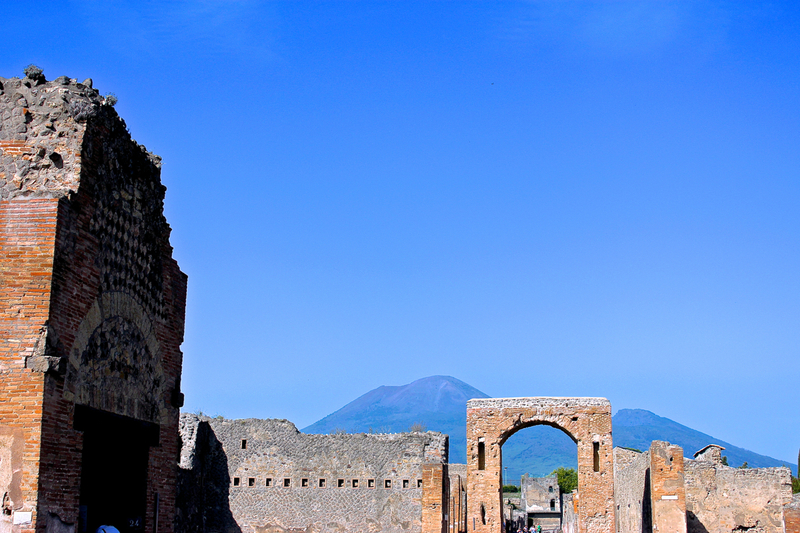 This shot was taken from the ruins of Pompeii, a few minutes ride from Naples. If you ever go to Italy, I highly recommend that you take a full day (wearing comfortable walking shoes) and visit this preserved ancient city. 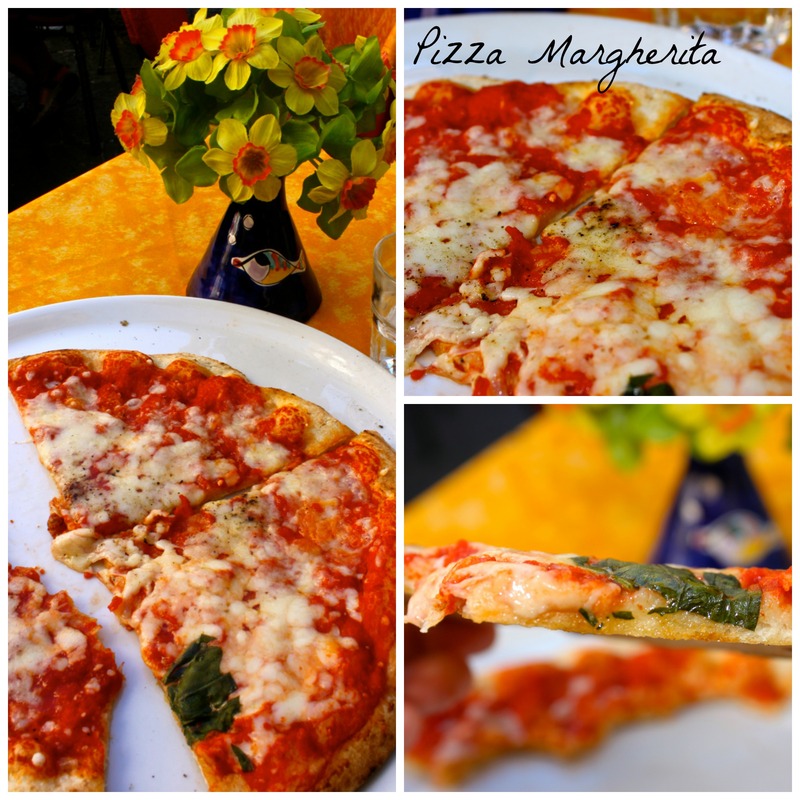 Enjoy this recipe for Pizza Margherita! This is my go to pizza, just as soon as I get some basil growing! Your home pizza looks really fabulous. i can’t wait to try it! OMG roz.. you hit my weak spot!! !It’s so hard to get the right crust because that’s what makes it soooo good!!! This is my favorite pizza…the thinner crust the better. Yours is beautiful. I can’t wait to try your recipe. This is my favourite pizza. I have a pizza stone and now that my reno is done (yeah) I can hardly wait to make it. Looks delicious, maybe Pizza this evening, but we do not make our own, either enjoy our neighbours or visit one of the local excellent pizzerias. For me there is no better way to eat pizza, yours looks like a real pro did this for sure! I would pay you for one! Lovely picture, mouth watering and computer screen eating worthy! It doesn’t get any better than the freshest ingredients atop a thin crust. Time to get some basil planted! What a spledid and mouthwatering pizza! Fantastic. Nothing can beat homemade pizzas. I love this pizza Roz! Yummy! I featured your blog tonight on my post. Already follow just stopping by to see what is for dinner. Based on your gorgeous pictures I would say your pizza can certainly hold it’s own! I love a good margherita pizza. With ingredients like that, who needs the meat? Wow…this pizza looks amazing. Wish I could take a bite right now! I want to just dive into the computer screen – that photo looks so inviting. I just ordered a pizza stone by email and when it arrives – this will be on the agenda. I’m a sucker for the classics ~ Looks delicious! Oh, I think I will be getting pizza for dinner!!! Your post is just so tempting! Hi Roz! 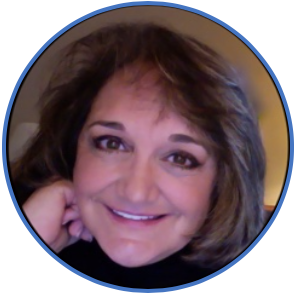 I’m inviting you to join me in a cook-along with Lidia! It’s pizza margherita this month! I knew you would have an awesome pic and recipe. Just visit my latest blog post! Thanks and have a great week! 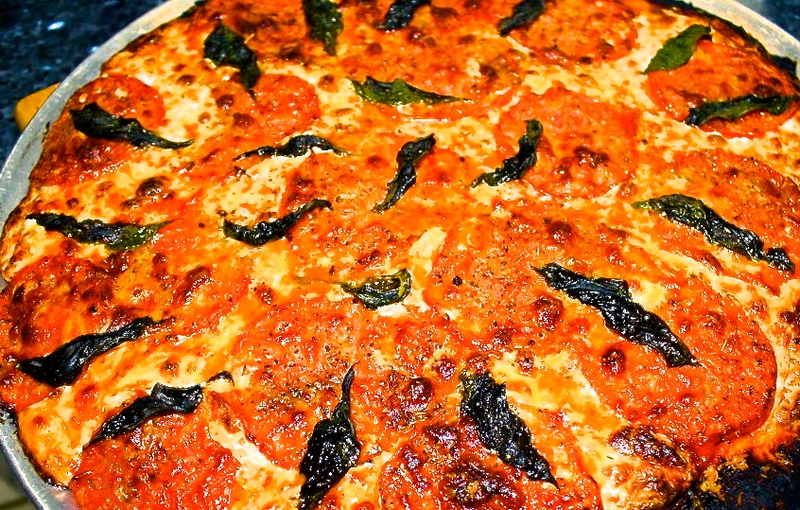 Is there really anything better than a slice of margherita pizza?! I think not. SO summer perfect! Joanne, It’s just one of my favorite pizzas too . . . just so fresh and vegetarian too! (Of course, my husband likes some sausage on the side for his meat-loving preference! The Margherita pizza is by far my favorite pizzas. When it comes to pizza, simplicity best for me. I’m glad you recommended Publix dough. It’s almost as good as homemade. Yes, I am unashamed to say that I use Publix pizza dough . . . it’s fresh and not frozen and delicious! It’s always so nice to have you stop by and visit. Hope you’re having a wonderful summer in the Carolina’s. I am HUNGRY! I haven’t had a pizza in a really long while…now I am craving for a good margherita pizza! I should be having ripe tomatoes from my garden soon and your pizza recipe is the perfect way to use some of them. There’s nothing better than the classic, and I adore New York style pizza! I love pizza and yours looks delicious. My hubby makes homemade pizza but since he can’t eat it as much, he hasn’t made it in a while. Luckily I live in a place where good NYC pizza is readily available. Your pizza looks perfect, Roz! I love the basil and oregano on the top. I haven’t made pizza in so long, and have been wanting to make it. My husband also likes meat on his pizza just like your husband so would have to add it on half of the pizza. Thank you for sharing such a wonderful recipe. I loved hearing about the history, too! Gosh, that is beautiful. A real Classic Margherita is both sauce and tomato slices. the balance of the tomato and cheese is very important. Yours is a work of art! I can’t thank you enough for your sweet, kind compliments of my Pizza Margherita! I would have loved to have shared it with you Margot! Good luck with the giveaway and welcome to my blog and part of my family! Wow! This looks so good! I would love to make it. This is about as classic a recipe for Pizza Margherita out there. I hope that you make it, since it SUPER EASY. Get your hands on the freshest tomatoes possible and not those rubbery, tasteless tomatoes in the stores. Let me know what you think and I’ll be happy to feature you in this blog post!